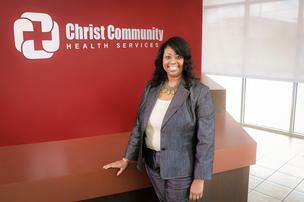 The newest chief executive officer of Christ Community Health Services (CCHS) began at the organization nearly 20 years ago as an administrative assistant. Shantelle Leatherwood is a native of South Memphis, a Central High School alum as well as graduate of Tennessee State University, with a B.S. in Health Care Administration and Planning, and the University of Missouri with a Master of Health Administration. In 1999 Leatherwood returned to Memphis after nearly three years in Missouri. After returning, she applied to be the administration assistant to CCHS’ director of Outreach Services, Alex Galloway. In four years, Leatherwood was practice administrator, overseeing CCHS' operation at the time, comprised of two health centers and a mobile van. After 10 years in that position, Leatherwood was promoted to chief administrative officer, a role she said directly prepared her for new job. During her tenure with the organization, Leatherwood directly contributed to its growth, going from three locations to the current eight and securing more than $20 million dollars in local, federal and state grants. With locations in areas of Memphis that lack primary care and medical specialists, CCHS works with hospitals like Methodist Le Bonheur Healthcare to help patients using emergency rooms for primary care move to a CCHS clinic for care. “I see us playing a significant role in improving health care outcomes in our community,” Leatherwood said. CCHS currently has 50 medical providers and five behavior health specialists as well as dentists and pharmacists. Leatherwood said the organization is currently working toward a more integrated model of care, where patients can be treated holistically, including addressing wellness and social needs. “Those are [problems] that generally exacerbate other things,” she said. As CEO Leatherwood wants to increase CCHS’ outreach to youth and women and to increase offerings for adults with developmental disabilities. “It gives me joy to have the opportunity to serve,” she said.